George Graham Reviews Richard Bona's "Reverence"
The last decade and a half has seen a significant number of outstanding African-born artists with worthwhile album releases in the US. Paul Simon's 1986 Graceland album helped to serve as a catalyst to bring to American audiences a music scene which was beginning to blossom at the time. While most of the so-called Afro-pop performers create music that is based on African styles but with Western influences, this week we have a new recording from a Cameroonian native who is based in the US and whose biggest influence is probably American jazz and fusion. It's the second release by Richard Bona called Reverence. Richard Bona was born in 1967 into a musical family in a small village in eastern part of the West African country of Cameroon. His grandfather was a prominent percussionist and vocalist. His mother also was a singer. From an early age, young Richard took a great interest in music and was performing for church groups by age 5. He soon took to constructing his own instruments including percussion instruments, flutes and even a 12-string guitar with strings made of bicycle brake cables. By his teens, Bona sought out larger audiences than his village, and moved to Cameroon's largest city Douala with his father. There, he was hired by a French hotel owner who was a jazz fan. The hotel supplied the instruments, and Bona was spending all his spare time learning as many instruments as he could and learning to read and write music. To encourage Bona's interest in jazz, the hotel owner made available his large collection of jazz LPs. By co-incidence, the first record Bona listened to was the debut release by the late Weather Report bassist Jaco Pastorius. Discovering that music was a life-changing experience for Bona, who decided to concentrate on the bass, and seek out as much music in jazz and fusion as he could. 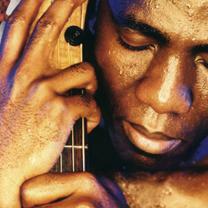 Bona, like many other prominent African musicians, moved to Paris to be part of the active expatriate music scene there. He was 22 when he arrived in the French capital in the middle of the winter, where the weather nearly made him turn around and go back to his tropical home. But he soon was participating in the music scene, working with such performers as jazz violinist Didier Lockwood and African pop luminaries Manu Dibango and Salif Keita. He stayed seven years in Paris, honing his musical skill through both performances and formal studies at music conservatory. An American jazz player met Bona and invited him to come to New York for a gig, and he soon began to attract attention. Bona moved to New York in 1995, and since has been working with a wide variety of artists, including Weather Report's Joe Zawinul, and singer Harry Belafonte, for whom Bona was musical director for over a year. He has become an active studio musician, working with people like Bobby McFerrin, Randy Brecker and Branford Marsalis. In 1999, Bona released his debut CD Scenes from My Life, a fascinating and attractive blend of his jazz influence with African ingredients. Bona sang in his native Douala language for most of the CD. The new recording continues the basic outline, but Bona set out to expand his musical horizons some, and he succeeds with a fine album that runs from acapella in the African style to orchestral settings. As on his last album, the biggest influence is the jazz-rock fusion scene, running from something akin to the light, so-called "smooth jazz" to a bit of the fast paced playing of people like Pastorius. Bona plays a significant number on instruments, including bass, guitar, keyboards, flute and percussion. He also lends his appealing high vocals to most of the CD. With his experience playing jazz bass as a sideman, he was able to attract some well-known players to join him, including guitarist Pat Metheny, saxophonist Michael Brecker and drummer Vinnie Colaiuta. Also making a significant contribution is arranger and keyboard player Gil Goldstein, who wrote the interesting string arrangements that serve as a bit of a surprise on three of the tracks. Richard Bona's new second album Reverence is another fine recording from a versatile multi-instrumentalist and composer who weaves the influence of his native West Africa into a rather wide-ranging jazz-rock fusion setting. His appealing vocals, his first-rate musicianship, and gift for coming up with happy combinations of influences, makes this an appealing album that rewards repeat listenings for its blend of skillful cross-cultural musical eclecticism and fine playing. Even though Bona sings in a dialect few Americans know, and the CD booklet contains only synopses of lyrics, rather than translations, his vocals serve as another instrument, illustrating that music can be a universal language. For sound quality, we'll give this CD a grade "A." Bona himself produced and recorded a fair portion of the CD, though it was mixed by Rob Eaton, who works with Pat Metheny. The sound has near-audiophile clarity and there's a good dynamic range. I recommended Richard Bona's first album in 1999 as world music that might well find an audience among those who may not think they like world music that much. This CD is in the same category, with its generally attractive and sophisticated sound, along with a lot of interesting musical ingredients.